This article is a short summary of Mario Party Advance. It's a Party to Go! 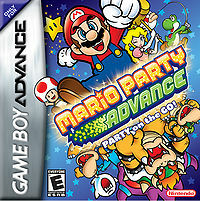 Mario Party has been packed into a portable Single-player adventure! Bowser scattered mini-games and Gaddgets around Shroom City - go there and help! Play mini-games and Gaddgets earned in Shroom City and clash with your friends! You can also link up and share mini-games and Gaddgets! This page was last edited on 20 January 2016, at 21:41.